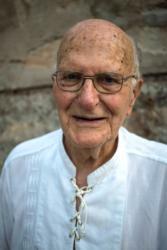 ASUNCION, Paraguay (CNS) — It does not matter if it is in a demonstration against the International Monetary Fund or to support a small displaced indigenous community, Spanish Jesuit Francisco de Paula Oliva, 90, will be there. Father Oliva is an emblem of the daily struggle for social equality, a show of coherence between action and discourse. Many Paraguayans use the Guarani word for Father and refer to him as Pa’i Oliva. “The work of Oliva in favor of young people to open their eyes and to think with their own criteria and have a human commitment to society earned him expulsion by Alfredo Stroessner,” Paraguayan Sen. Carlos Filizzola said during the tribute, referring to Paraguay’s former dictator. “I accepted the award as an acknowledgment to the Paraguayan people, on behalf of indigenous peasants and women. It’s for everyone,” he added. Francisco de Paula Oliva became a Jesuit at the age of 18 and, after a brief mission in Japan, he arrived in 1964 to work as a teacher in Paraguay. He became a Paraguayan citizen the following year and a month later was expelled by Stroessner’s dictatorship. The police stopped him, put him on a boat and took him to the other side of the river, to Argentine territory. There he stayed for nine years, assisting Paraguayan and Bolivian migrants in Buenos Aires while he was being watched by the police and the army.